Today, the complexities of both the LightSquared and DISH regulatory processes both got even more messy. In the DISH waiver proceeding, AT&T filed an ex parte submission urging the FCC to impose buildout conditions on DISH similar to those imposed on LightSquared (260M POPs within 5 years 9 months), rather than any financial clawback to address the increase in value of the spectrum that a waiver would produce. AT&T also asks for conditions to be imposed on DISH’s 700MHz spectrum in line with the conditions imposed on AT&T’s recent purchase of spectrum from Qualcomm. This submission is a blatant attempt by AT&T to put a thumb on the scales, as the FCC weighs up the appropriate balance between buildout mandates and clawback of any windfall. The reason for AT&T’s action at this very late stage in the process appears to be that DISH is trying to play off AT&T’s prospective bid against a potential venture with MetroPCS. MetroPCS would certainly be unwilling to commit to a 260M POP buildout, so if the FCC conceded AT&T’s demands, they would be the only game in town and DISH would lose its leverage in price negotiations. We’ll find out soon enough if AT&T’s gambit succeeds, but few would bet against Charlie Ergen’s poker playing skills after the events of the last year. In the even more complex LightSquared process, the FCC has today issued a Public Notice establishing a Pleading Cycle in respect of LightSquared’s December 2011 Petition for Declaratory Ruling, which sought to establish that GPS receivers were not entitled to interference protection. This Pleading Cycle, with comments due by Feb 27 and replies by March 13, almost certainly pushes back an FCC ruling on the LightSquared testing into the second half of March, because the FCC would want to deal with all of these issues simultaneously. As a result, attention is now likely to be focused around April 1 (appropriately enough All Fools Day), when LightSquared is due to make the next interest payment on its debt and another ~$30M payment to Inmarsat. The reason for this is because LightSquared has indicated that, in the event it was blocked from operating, it would withdraw the January 2011 waiver application and claim it had the right to operate a dual-mode (satellite-terrestrial) service under the conditions of the FCC’s 2005 rulings. While that might not be economically viable (or practical), the FCC would presumably then be forced to step in to protect GPS and thereby supposedly “infringe” on LightSquared’s claimed “property rights”. The Petition for Declaratory Ruling is also an attempt to eviscerate the interference protections contained in the 2005 rulings (referred to as CFR 25.255) and thereby make the supposed infringement of LightSquared’s rights all the more obvious. Thus, from this Public Notice, it does appear that the FCC is at least cognizant of LightSquared’s legal strategy, and is likely (as I predicted) to ultimately rule that the Interference-Resolution Process should be prolonged (and extended to cover GPS receiver/interference standards) and that in the interim LightSquared will be prohibited from commencing any terrestrial operations. LightSquared is apparently contending that this wouldn’t constitute a MAC on its debt covenants, but I suspect that’s an argument some of the debtholders (including Mr. Icahn) will want to test in court. All this makes for a very complicated set of legal arguments, but one additional piece of information did emerge today that sheds some light on the big picture of why it has been so hard for spectrum holders to monetize their assets, and why the FCC has come in for so much well deserved criticism. DSL Prime is reporting that growth in mobile data usage is running at less than half the level predicted by Cisco and that the FCC staff “demanded their name be taken off” the FCC’s October 2011 demand forecast, because they “didn’t believe the claims in this paper”. However, with so many gullible journalists and investors buying into the idea of a (manufactured) “spectrum crisis” rather than a “spectrum bubble“, perhaps its a bit less surprising that LightSquared has been able to raise over $2.5B of investment in the last 18 months. After some uncertainty, it appears that LightSquared’s debtholders are gradually coalescing around Mr. Icahn’s view that they should invoke the MAC clause in the debt covenants and force LightSquared into bankruptcy immediately after an unfavorable FCC ruling, assuming that comes in the next couple of weeks. The key reason for this would be that LightSquared is due to pay Inmarsat $56.25M on February 18 (18 months after LightSquared gave the Phase 1 notice to Inmarsat under their Cooperation Agreement) and that sum of money is potentially big enough to make a material difference to the ultimate recovery, assuming that a liquidation is the eventual outcome of the bankruptcy case. As debtholders get increasingly angry about this debacle, it also seems that they are looking around for other people to sue. Interestingly, it was suggested to me that (in addition to Harbinger) one potential target would be UBS, because the extent of the GPS interference problems may not have been disclosed fully at the time of the $586M February 2011 debt offering (UBS were the arrangers for this loan). I for one had already blogged about the potential extent of the GPS interference issues in January 2011, based on testing that I had been told about by a major equipment manufacturer. In that case the engineers were so astonished by LightSquared’s proposed power levels that they brought in their personal car and handheld GPS receivers and noted considerable interference many hundreds of meters away from the test transmitter. In particular, it was pointed out to me that third order modulation interference into the middle of the GPS band was essentially an unsolvable problem under LightSquared’s original 10L and 10H configuration. As a result this company had already concluded that (at the very least) use of the upper band spectrum was infeasible, well before the loan was sold to investors, and it can hardly have been long after that before LightSquared started negotiating with Inmarsat over the revised spectrum plan which was signed on April 25. Indeed my discussions with many knowledgeable people in mid-March (at the Satellite 2011 conference) indicated that everyone (including people with connections to LightSquared) already believed that use of the upper band would never be feasible (Note: the Field of Dreams reference in this link is still my all-time favorite – so thanks again to the unnamed satellite industry executive who noted the Chisholm, MN connection). This evening Reuters is reporting that Mr. Falcone is examining “the potential for selling [LightSquared's] right to certain spectrum leases” to “raise cash for his financially strapped telecom start-up”. Those leases are presumably the 8MHz of 1.4GHz spectrum that LightSquared leases from TerreStar Corp and the 5MHz of spectrum at 1670-75MHz that is leased from Crown Castle. However, its hard to see how LightSquared could raise any meaningful amount when any buyer would have to take over the underlying lease obligations ($24M per year for the TerreStar spectrum and $13M per year for the Crown Castle spectrum) and there is no clear buildout plan for either band. Indeed LightSquared had not even planned to include the 1.4GHz spectrum in its LTE network, instead entering into an agreement with Airspan Networks in August 2010 under which Airspan would “exclusively market LightSquared’s 1.4 GHz wireless spectrum” to the utilities industry as “a comprehensive solution for Smart Grid and Smart Utility applications” (though with no visible success to date). Other news emerging today is that I’m told the NTIA plans to release its report on the November 2011 testing next week, presumably accompanied (concurrently or very shortly thereafter) by its recommendations to the FCC. It appears that the NTIA will back the PNT Excom recommendations (most likely including that there should be no further testing at this time and that there should instead be a consultation on GPS receiver standards), and it could hardly do otherwise, given that the test procedures criticized by LightSquared were specified by NTIA in the first place. Remember also that last August Mr. Strickling believed LightSquared was “in Wonderland” in thinking it could move forward after the initial test results came out. I’m also told that LightSquared is trying very hard to pressure the FCC to overrule the NTIA, and order that the high precision testing should start within the next two weeks. However, that hardly seems plausible given the political firestorm that would be ignited by a public disagreement between the FCC and NTIA. Messrs. Genachowski and Strickling will be in Geneva this weekend for WRC-12 and it sounds like they will be very busy trying to avoid that situation. As a result, we might well see the same outcome as in September, when the release of the NTIA letter was followed very quickly by an FCC response (which in that case was to adopt the NTIA recommendation). It definitely looks like next week will be a very busy one, so follow me on Twitter @TMFAssociates for all the latest information. UPDATE (1/22): It appears that the NTIA recommendations letter will have to wait for Mr. Strickling to return from Geneva, so we may not see it until the week of Jan 30. I also now expect the FCC to order a (pretty lengthy) GPS receiver standards rulemaking, which will allow for further testing and debate on when the lower band spectrum might be useable for terrestrial services (think 2020 or thereabouts, though we won’t have any definitive transition timeline until 2013 or even 2014) and conveniently put off any decision until after the November election. Of course, because LightSquared will be unable to operate its terrestrial network in the meantime (almost certainly a MAC for its loan covenants), that will likely set off a major battle amongst the debtholders about what to do next, with Mr. Icahn likely to try and force LightSquared into bankruptcy in the near future, while some other debtholders might be more supportive of Mr. Falcone if they still believe he can see this process through. Assuming that the FCC did agree with the NTIA and stated that it was prohibiting LightSquared from commencing terrestrial operations for the foreseeable future, the most interesting question will be the grounds for its legal authority in doing so. LightSquared has indicated that it would withdraw the waiver request in these circumstances, and that it believes this would render the condition (requiring GPS interference concerns to be resolved) imposed in the January 2011 order null and void. In that case, the FCC would probably have to fall back on the authority that the GPS industry (plus others such as CTIA) have asserted all along (and LightSquared has challenged, most recently in its Dec 2011 Petition for Declaratory Ruling), that CFR 25.255 (“If harmful interference is caused to other services by ancillary MSS ATC operations, either from ATC base stations or mobile terminals, the MSS ATC operator must resolve any such interference”) provides absolute protection against LightSquared being permitted to cause harmful interference. In that case we could expect to see LightSquared launch legal action very quickly, in line with the position adopted in its December petition. Last week I expressed the view that LightSquared’s new investors could very well prolong the fight between LightSquared and the GPS industry. However, signs are starting to emerge that the FCC might be more willing to act than I had anticipated, and rule against LightSquared, which would potentially create a Material Adverse Change (MAC) in LightSquared’s first lien debt covenants, allowing the new investors to force the company into bankruptcy, and wrest control from Harbinger. While I still believe that the end game will involve liquidation of the business (not to mention litigation against all and sundry), the current debt investors would certainly benefit if they didn’t have to wait until all of LightSquared’s money had been spent in advance of a bankruptcy filing. We are awaiting completion of recommendations from NTIA. As we have said from the outset, the FCC will not lift the prohibition on LightSquared to begin commercial operations unless harmful interference issues are resolved. Of course that is not what the FCC has said from the outset. Last year they said the agency won’t let LightSquared activate its network “until harmful interference issues are resolved”. Though subtle, that is quite a change in position, and an acknowledgement that the interference issues might not be resolvable. More importantly, today has seen the resignation of a second high ranking FCC official and now both Ed Lazarus and Paul de Sa, who apparently negotiated the deals with SkyTerra (in early 2010) and LightSquared (in late 2010/early 2011) are leaving the FCC at a time when Sen. Grassley is shortly expected to receive details of LightSquared’s communications with the FCC. Indeed these two officials also met with Mr. Falcone when he visited the FCC on January 4. To misquote Oscar Wilde, to lose one official may be regarded as a misfortune, to lose both looks like carelessness. If (and I do mean if) there is something problematic to emerge from the communications between LightSquared and the FCC, then it would certainly help to defuse the ensuing political firestorm if the FCC had already acted on the recommendations of the NTIA (which I think will very likely follow those of the PNT Excom). Communications Daily is now reporting that the NTIA has received the full report from the PNT Excom and will now review it and “eventually” advise the FCC how to move on the issue. However, if high precision testing is not going to be undertaken in advance of formulating these recommendations, the FCC could be in a position to rule relatively soon. Well it seems like all LightSquared has left now is an attempt to claim that the US government is biased against it, representing a remarkable turnaround from this time last year, when most people thought that any favoritism was going in the opposite direction. However, it appears that LightSquared’s protests are going to have absolutely no effect, because all of their allegations about how the testing was not “fair and accurate” simply reflect the NTIA’s own mandates for how the testing should be conducted. We want to do what is necessary so that our recommendations to the FCC regarding cellular and personal/general navigation GPS receivers can be conclusive and final. To that end, I want to make it clear that our recommendations will be based on NTIA standard definitions and methodologies for assessing interference. We will not accept conclusions or analysis based on propagation models and other tools that depart from our standard methodologies. Of course the “standard definition” as agreed for the June TWG report was 1dB of degradation, and it was only when LightSquared discovered that the June results were unfavorable that they came up (at the last minute) with their alternative proposal of allowing 6dB of interference degradation, which was never accepted by the NTIA. Secondly, the Sep 9 letter requested that “that the test plan include a retest of the 10 devices that were shown by the TWG testing to be more susceptible to the lower 10 MHz scenario”. Thus it was at Mr. Strickling’s explicit request that the testing “deliberately focused on…devices that were least able to withstand potential interference”. Finally the tests were “shrouded in secrecy” because they involved technical performance data on individual GPS devices which both the FCC and NTIA agreed to keep confidential. The same procedure was used in the first round of tests in order to avoid data being released on individually identifiable devices and it is far from clear what LightSquared is alleging was done differently this time. Indeed, with the most “susceptible” of the previously tested devices being included in the second round of tests, it would have been necessary to keep the list of tested devices confidential in order to avoid revealing which these “susceptible” devices were. It therefore seems clear that by LightSquared’s definition Mr. Strickling himself would count as one of the “government end users [who] manipulated the latest round of tests to generate biased results”. That doesn’t seem like a recipe for success when you are asking the NTIA to “objectively re-evaluate this initial round of testing” and ignore the recommendations of the PNT Excom. LightSquared has communicated its concerns repeatedly to PNT EXCOMM, NPEF and Air Force Space Command throughout this process, both verbally and in correspondence. All of these concerns have been seemingly disregarded. As you are aware, we have also corresponded with your office to make sure you were advised as the process unfolded. In addition, the letter states that the FAA had “unilaterally decided to suspend any further collaboration” with LightSquared. These two statements are very hard to reconcile with LightSquared’s briefing to investors that the interference issues were “under control”, which was the reason that new investors became involved with the company. As a result, these (and other) investors might now feel that its not only LightSquared’s (currently invisible) CEO who is lacking in credibility. There was certainly a rush for the exits yesterday, with prices on LightSquared’s first lien debt opening with a markdown of ~9 cents to 40-44 cents on the dollar, and then falling further to 38-42 cents during the day. As I indicated in my post on Thursday last week, the PNT Excom has recommended today, in a letter sent to the NTIA Administrator, that the high precision testing be put on hold, because “there appears to be no practical solutions or mitigations that would permit the LightSquared broadband service, as proposed, to operate in the next few months or years without significantly interfering with GPS”. This letter confirms that it will be impossible for LightSquared to move forward with its buildout plans in the foreseeable future. However, in the absence of any final decision from the FCC or NTIA, it seems unlikely that LightSquared will change its current course of pursuing approval by all possible means, for as long it has the money to do so. As a result, it may still be many months before this saga reaches a definitive conclusion. The primary reason for my belief that this will drag on for many months is that Harbinger’s position in LightSquared’s capital structure (subordinate to at least $1.6B of debt) makes it inconceivable that Harbinger would receive any recovery in a bankruptcy situation, and the first lien lenders are unable to stop LightSquared simply continuing to spend the current cash on LightSquared’s balance sheet for as long as it lasts. The only exception would be if a Material Adverse Change (MAC) occurred under the terms of LightSquared’s first lien loan, which could allow the lenders to issue a notice of default before the money is gone. However, it is hard to imagine that a MAC could have occurred solely as a result of an advisory committee’s recommendation and even if a response was to be issued by the NTIA in the near future, it is far from clear that a triggering event would have occurred. Nevertheless, this news does make it clear that my expectation about the ultimate outcome of a LightSquared bankruptcy (namely that no terrestrial network will ever be deployed) is rather more plausible than the assumptions made by Icahn and other new investors that they could ultimately force through an approval. They must feel pretty upset that LightSquared was assuring them as recently as Tuesday that the technical issues had been solved (despite LightSquared apparently being unable to offer any “practical solutions or mitigations” to the problems identified in the November tests) and that it was only the politics of the situation that were preventing the FCC from approving their network. 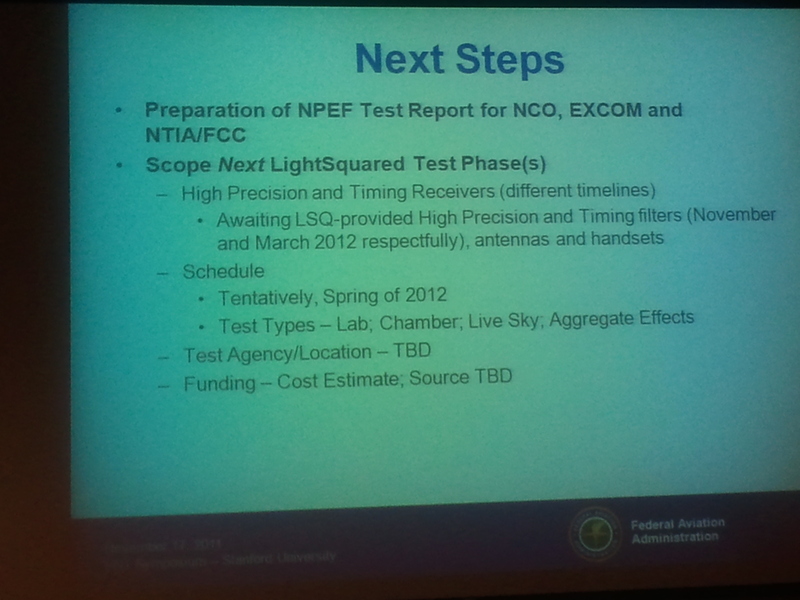 UPDATE: This presentation was also posted by NOAA on Friday, giving more details of the November 2011 testing. Apparently these tests did include some high precision devices, which were badly affected by the LS lower 10 signal, even at very low operating power levels. As a result, NOAA conclude that a new filter will be required for these devices, and that is presumably one additional reason why LightSquared’s latest “power on the ground” proposal was not deemed to be a “practical solution”. Back in 2008, the decision of Maersk to choose Inmarsat’s FleetBroadband service for 150 (later increased to 370) vessels was described by Inmarsat as “a ground-breaking deal” which represented “the strongest possible endorsement of our revolutionary FleetBroadband service”. As a result, this week’s revelation that Maersk is now going to shift 400 vessels to VSAT must be a correspondingly earth-shattering blow to Inmarsat, because not only has Maersk decided to move away from FleetBB, but it has opted for a Ku-band solution from Ericsson and Thrane & Thrane (with a 7 year service agreement), rather than the XpressLink service from Inmarsat which would provide an upgrade path to the Ka-band Global Xpress service. Maersk’s average spend for the 370 ships using the FleetBB service was about $2600 per ship per month retail, implying that wholesale revenues to Inmarsat in 2011 were between $8M and $9M (and making them Inmarsat’s biggest single maritime customer for L-band service). While Maersk will presumably keep Inmarsat as a backup, its safe to say that the vast majority of this revenue will likely be lost once the transition is completed. The decision to make this change comes after Inmarsat’s move to impose usage caps on maritime vessels in October 2011 (with the data rate limited to 20kbps once the cap is reached), because Maersk had apparently been generating as much as 25% of all I4 (BGAN+FBB+SBB) traffic under its former unconstrained deal, and Inmarsat was worried about the saturation of its I4 network in regions such as the Middle East, which could impact higher value traffic from defense and media users. This news also comes in the wake of Inmarsat’s major reorganization, which was revealed in early January, and has led to the exits of a number of senior managers in the government and maritime business. Despite Inmarsat’s claims that it “does not intend to change its policy of distributing its services primarily through independent channel partners”, the new management structure will have both direct and indirect sales reporting to the same people, which has been very poorly received by Inmarsat’s distributors, who clearly expect Inmarsat to cut them out of the business in the future, as Inmarsat emphasizes its own direct sales channels and gets “closer to our partners and customers” as the new CEO describes it. I’m told another part of the reorganization is that Inmarsat’s financial reporting will be realigned from Q1 2012 so that the four new business sectors (Inmarsat Maritime, Inmarsat Government US, Inmarsat Government Global and Inmarsat Enterprise) will report their own results on a total (retail) basis, rather than breaking out wholesale L-band revenues in land, maritime and aeronautical sectors separately. This will mean that a maritime customer transitioning from a FleetBB L-band service to a resold Ku-band service such as XpressLink will bring in the same (or more) retail revenue (albeit with a much lower gross margin), whereas previously Inmarsat would have had to take a hit to its wholesale L-band revenues to facilitate this transition. However, this is going to make financial analysts even more confused about the prospects for the company than they already are. Most analysts have maintained a very positive view of the company, and apparently the consensus view is that Inmarsat should continue to derive value from its North American spectrum assets, whether or not LightSquared files for bankruptcy. With the triple threats of continuing bad news in the maritime sector (where there is a pretty bleak outlook for shipping companies), reductions in defense spending (including the pullout from Afghanistan) and that Inmarsat might ultimately end up paying money to LightSquared’s creditors rather than receiving future lease payments, Inmarsat’s next results call is definitely going to be worth listening to. Farallon Capital Management dumped its stake in LightSquared’s USD 1.6bn first lien loan last month as the telecom company and sponsor Harbinger Capital battle regulatory controversies, according to two buyside sources and a source familiar with the matter. Displaying a greater taste for potential distress, Icahn Enterprises has emerged as a recent buyer of LightSquared’s bank debt in the low 40s, the two buyside sources said. The exit of Farallon signals the loss of one of LightSquared’s former anchor investors. The California hedge fund was one of the biggest par holders in LightSquared’s capital structure, owning more than USD 150m of the Libor+ 1,200 bps term loans the company raised to finance the build out of the its 4G long term evolution (LTE) network, the sources said. The loans were recently quoted at 43-45 from 90-92 at the beginning of August, according to Markit. However, I understand that the new investors, including Icahn, haven’t stopped believing that they will be able to overcome the opposition of the GPS community, and ultimately gain approval on the back of (what was described to me as) their greater “sophistication” and financial resources compared to Harbinger. Indeed, part of Mr. Falcone’s objective in his FCC meeting may have been to suggest that the FCC would have to deal with less cooperative owners of the assets in the future, if they delay approval and allow LightSquared to fall into bankruptcy. Its suprising that anyone could believe that they will succeed where Harbinger has failed, especially as the NTIA now appears determined to spin out the testing process for as long as possible (and almost certainly to beyond the November 2012 election). In addition, it would be easy for the FCC to initiate a (multi-year) rulemaking proceeding on receiver standards for GPS receivers, if they want to kick this issue even further into the long grass. Nevertheless, the implications are that LightSquared’s debt investors are likely to allow the company to keep pushing for approval, rather than trying to force it into bankruptcy more quickly in order to liquidate the assets before all the cash is gone. That would suggest a bankruptcy filing later in the second quarter rather than in the next couple of months. Ultimately, I think this will look a lot like the Iridium bankruptcy in 1999, where investors thought there was something worth billions of dollars that could be rescued with a bit more money and better execution, and spent nine fruitless months before they finally conceded that $5B of investment needed to be completely written off. The fundamental reason why I think their efforts will fail is that the continuing lease payments to Inmarsat ($115M per year) very likely outweigh the value of 20MHz of L-band spectrum, which at best might be usable terrestrially in 5-10 years time (if approval was even granted). At this point there is no way that Inmarsat is going to compromise on these lease payments, because the whole LightSquared affair (which Inmarsat enabled through the 2007 Cooperation Agreement) has deeply upset the DoD, which accounts for ~20% of Inmarsat’s total revenues (and probably an even higher proportion of the Global Xpress business plan). Indeed, some within Inmarsat might feel they would give back the money paid to date, if only the whole LightSquared mess could be made to go away. Inmarsat already appears to be telling the DoD that it was not their fault, because they were ordered by the FCC (under a Republican administration) to enter into the Cooperation Agreement, against their better judgment. In that context, Inmarsat’s protests in January 2005 that approval of the ATC plans proposed by LightSquared (then MSV) would lead to substantial degradation of MSS services due to overload interference, now appear very prophetic. As a result, I expect the end game (which is now unlikely to be reached before 2013) to involve a combination of trying to recover the money paid to Sprint and not spent on deployment, selling the ground spare to Boeing, and agreeing to sell Inmarsat the in-orbit satellite and spectrum assets in exchange for a return of a sizeable proportion of the ~$500M paid to date. Whether that will be sufficient to provide downside protection to buyers of LightSquared’s first lien debt (totalling ~$1.6B) “in the low 40s” remains to be seen. However, I’m told that even more damaging information is likely to emerge shortly, indicating that the NTIA’s planned testing of the compatibility of high precision GPS devices with LightSquared’s network has been put on hold. This testing was supposed to take place in the near future (perhaps as soon as this month, although a more realistic timetable was spring 2012). It was reported in December that LightSquared had not yet provided the filters for this testing program and it is unclear whether this is a contributing factor in the decision, or if the NTIA has simply decided that it is not worth expending resources on the testing until the issues revealed in December about the interference with general purpose navigation devices and an aviation terrain avoidance system have been addressed. It seems that the full details should be forthcoming once the NTIA sends its formal report and recommendations from the December 14 meeting to the FCC. UPDATE (1/6): When FierceWireless asked the NTIA about this blog post, their spokesperson indicated that “federal testing has not yet begun on high-precision devices. We won’t speculate further on timing other than the fact that it would be appropriate for the high-precision testing to take place after the analysis of the location-based/navigation device testing is complete.” This certainly appears to be a change in stance from the September 9 letter from the NTIA to the FCC, which stated “At that time [when LightSquared presents its filtering solution for testing and evaluation], the federal agencies will need to develop and execute a plan to test and analyze LightSquared’s proposed mitigation”, because LightSquared certainly believes it has already “presented” its proposed solution to the Federal agencies for testing and evaluation. Separately, another source has confirmed to me that there is no agreed timeline or funding for the high precision and timing testing, especially given recent cuts in the FAA budget. As an aside, the Reuters article on LightSquared’s finances appears to broadly confirm my assessment that LightSquared is likely to run out of money by the second quarter of 2012. In view of the net loss of $427M in the first three quarters of 2011, it also seems that my estimate of LightSquared’s cash burn rate is in roughly the right range. However, I’m told by another source that my supposition that LightSquared might not have repaid the Boeing vendor financing is incorrect, and that in fact, as LightSquared has stated, the company has raised “over $2.5B in debt and equity” (at least $150M more than I had estimated), which accounts for this discrepancy. Indeed, with the Boeing loan repayment only being $120M, LightSquared’s cash burn over the last two years must have been even more than I had projected.